I am working on the CT post, but it is looming larger than I originally planned both temporally & spatially ! 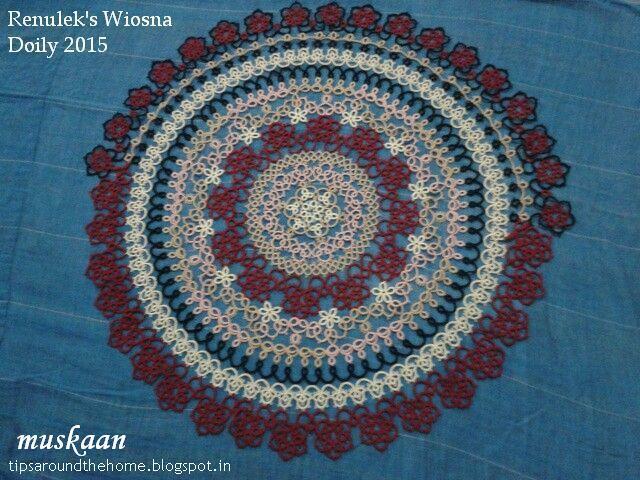 It started as a simple flowery freeform pattern, where I had intended to add some more rings & green foliage. However, this seemed complete as is. So threads were tied & cut off. A nifty way to spice up any old studs you may have lying around ! 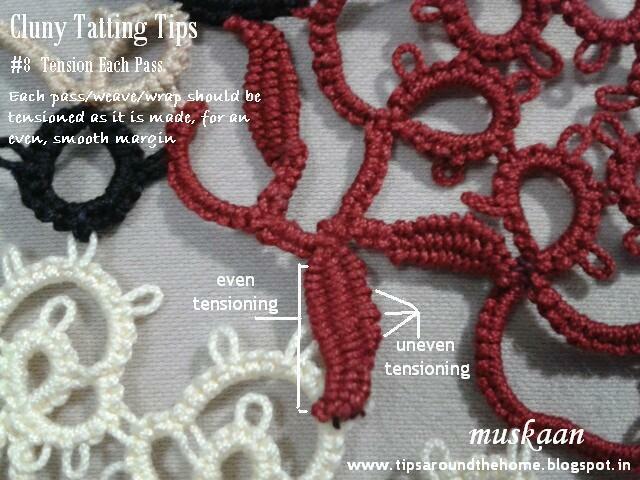 Cluny tatting technique used here is basic. Only the logistics & thread engineering convert it into a 3D form. It is a simple front-tatting only pattern where one starts with a central ring (make sure it is slightly smaller than the size of your studs) & goes on to make Cluny tatting petals & chains with decorative picots. I haven’t drawn a diagram . The notations seemed direct enough ; however, if anyone desires, please let me know & I will diagram the pattern. I have, however, listed some ideas for variations on this prototype. No stiffening was required - the petals hold their shape if the wraps are sufficiently dense/packed down. 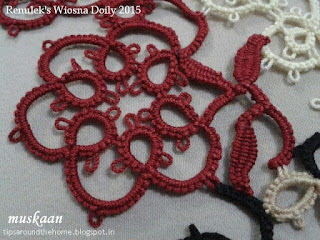 This is how the tatting looks from behind, with the stud in place. Add a pearl or bead in central ring directly. Add the findings in the last petal pair & you have a complete earring ! 4 & 5 warp clunies can be used for the back petal as they will naturally become larger & broader. 2 different shades/colours can be used for the front & back petals. I have a question for designers please : How can I get a shareable pdf link with customized name ? I tried Google Docs, but it converted the 2-page pattern into 4 pages !!! Google search was of no help either ; probably didn't ask the right question ?! I’m not calling it the Grand Finalé : questions remain – is it grand / obscure ; is it really final / to be redone later ?! Well, whatever it is it’s done for now. And I can certainly say it is unorthodox & experimental, perhaps even quirky. Will I ever come back to rework the last round(s) – I’d like to, but doubt it. Rather make a different one . The discussion is 'broken' into some categories that may be worth considering – some of the factors that went into my reasoning (!). Although categorized, the format is a kind of stream of consciousness, based on relevant comments, my feelings, & mental calisthenics that led to decisions (along with final thoughts on the same). 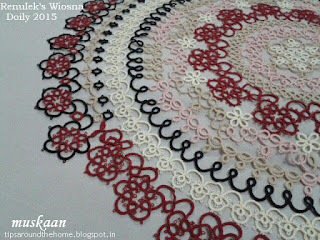 I think the categories might act as designing tattisms for beginners, as well as when making all the choices for a new tatting project. Details of Rounds 1-9 in previous post here. All comments can be read here, & here. I would strongly recommend a quick perusal – it is a treasure trove of experienced sharing. In order to avoid confusion, the name of the commentator has not been changed. I wish I could’ve added each person’s name for their valuable inputs. While I focused on the colour arrangement, I learned something important about designing from Anonymous (StephanieW). Spacing within & between rounds to balance lightness/laciness with heavier/denser pattern. That was the reason a simple round like this was required to space out 2 denser rounds ! Another angle to Spacing can be in the ‘distancing oneself’ sense, either temporally & physically (as suggested by Martha) . It generally brings perspective & restores motivation. This can be part of the Spacing aspect, but I think it deserves a Special mention, because it has functional implications for designing as well as for choosing colours. mb duke introduced this perspective (new to me) . Consider whether a round is a “filler” round or a “feature” round. 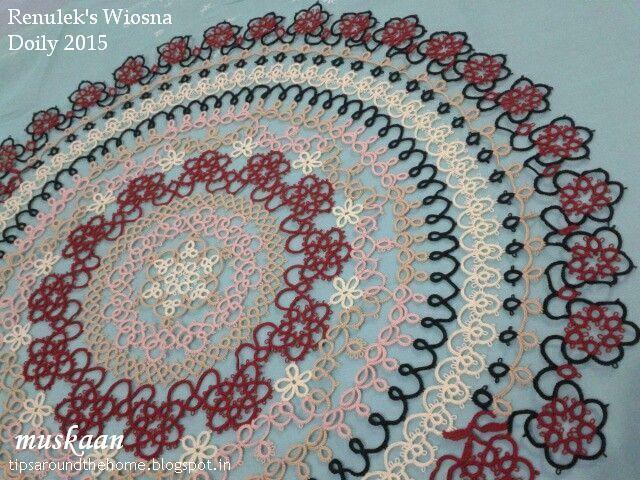 In these times of colour tatting, the tatter can choose which rounds s/he wants to bring forth/highlight, & which can be kept in the background. The terms are self-explanatory. Filler round(s) serve mainly to highlight the Feature round(s), hence will be more in the background, with subdued/muted colours & patterns. Feature rounds can’t be clubbed close together, otherwise their identity & usp will get lost; hence fillers are essential. Both play a crucial role. 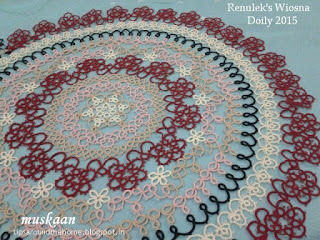 My Feature rounds in this doily, from the start, were the individual cream flowers in Rnd 5, the undulating Rnd 6, & Rnd 9. Unfortunately, Rnd 6 became muted when I chose maroon for Rnd 4 & therefore couldn’t repeat it so soon. It became a feature round unintentionally. As for Round 10 : Went with the majority vote & chose to do it in 2 colours. Since the Feature Rnd 9 was a light shade of cream, a darker colour was required to highlight it. Black did that highlighter job , while the beige chains & rings on the outer edge served as a subdued filler for the last dark coloured round. Can the same round can act partly as a feature, partly as filler ? Round 11 as Round 4 : Match or Mix ? Rounds 4 & 11 are identical in pattern. So if an earlier round has been done in a particular colour(s), should the latter also follow through ? Jane McLellan , Lace-lovin' Librarian ~ Diane & my DH thought there Should be echoing . I agree, but then I should’ve spaced it with the filler Rnd 10 (which most recommended); a mistake that could only be rectified by snipping what I had already tatted. Also, I did want a black outline to bring it all together – I didn’t quite like to stop at that particular pattern, because after all, it was the same as an earlier round. So it didn’t seem like a Final round to me. 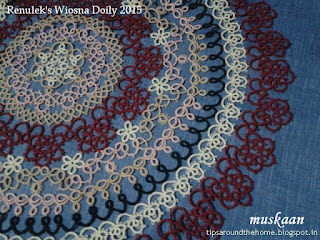 My intention was to add a black chains-only outlining round, Echoing the Contours of the previous round . I delayed, I procrastinated, I over-thought, I overanalyzed, I stalled, I shelved, …. the waters had been thoroughly muddied :-( Following GraceT’s advice, I started a maroon rings & black chains last round over the Round 10. But I still couldn’t decide ! At times it seemed okay, at others it seemed too dark & heavy. My brain went into freeze mode. Stoically, in order to complete what no longer excited me, I continued with the remaining half, differently from the previous half. Thus paying a price for my ambivalence & overthinking . Follow Fox’s advice to avoid “overthinking & muddying the waters”. It Will have a ripple effect ! Round 11 : This Half Or That Half ?! 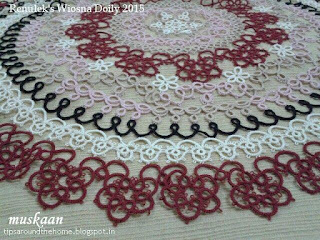 With my mind in a tizzy whether to continue or cut, each stitch seemed a burden (and meanwhile I had tasted the pleasures of tatting a doily in size 40 thread !) . Practicality took over . Madtatter80 used this lovely term ‘tablescape’ – what & where will the item be used on/for ? This can inform our decisions regarding choice of pattern, size, colour, shape, & so on. I rationalized, that since this doily was going to be draped over my sewing machine, which is against a wall & window, only One side/half will be visible at any given time ! Problem solved ! I had already ‘broken the round’ in Rnds 6 & 7; I could do it again ! So that’s the story … Both halves stayed. Any changes in decision are relegated yet again to another day in the faraway future. Practical decisions can still leave some lacunae. 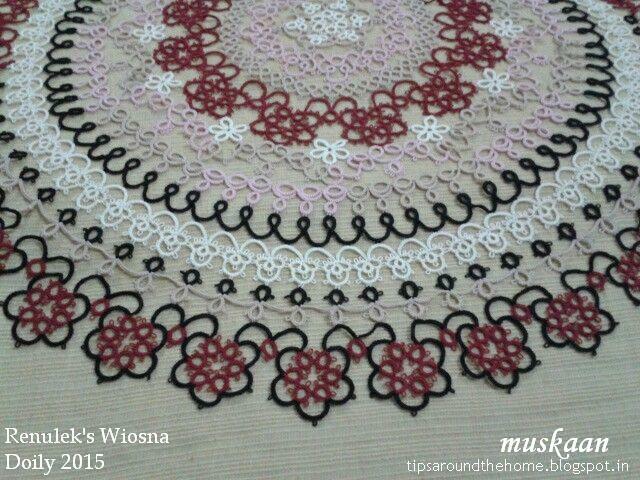 One half of doily had Round 10 missing & I was in no mood to add the black chains-only final round to the maroon half as initially intended. That meant a gaping hole on both sides, where the twain shall met. Closing the gap with rings & chains in keeping with the pattern, was the obvious choice. But I had just got into learning Cluny tatting. Tallies, especially hanging tallies/clunies could so easily span the gap !!! 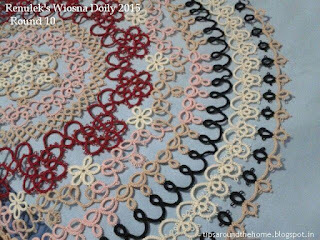 How very tempting, considering my huge preference for freeform, free style tatting ! An Olive Branch, it was that brought Peace to my tortured mind ! 3 leaves each on a twig. These are still at the beginner stage, so the weave is not too tight & even. Plus I was working in a small confined space, with Lots of threads hanging about (I didn’t want to cut & hide, in case this didn’t work & something else needed to be done). My inexperience also meant a lot of undoing & redoing. But my excitement remained unabated. I had picked out the linen cloth over which the doily will be draped (a deep blue type colour, over which I had taken a few previous pics), but couldn’t find it again for these pics. When I do find it I will take a couple more pics – that background does true justice to all the colours. All in all a very eventful, exciting. & enlightening journey, though it stretched out a bit towards the end because of my ambivalence. After the Horse has Fled the Stables ! 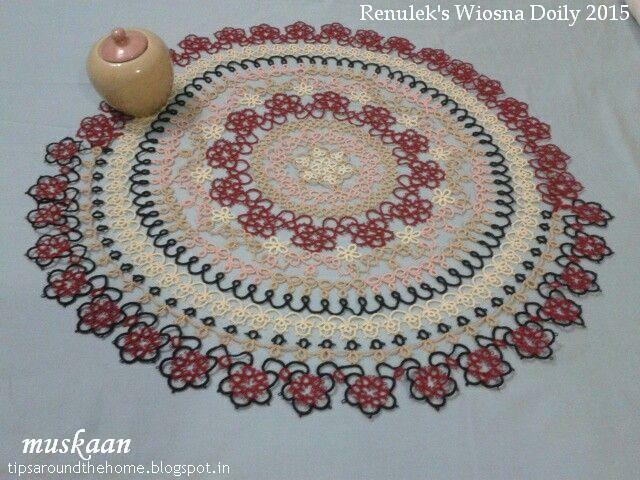 If I get into the zone to cut off & retat the last rounds of this doily, I would go with black & beige for Rnd 10 & all maroon for Rnd 11. Hmm, or, all beige for Rnd 10 & maroon & black for Rnd 11. 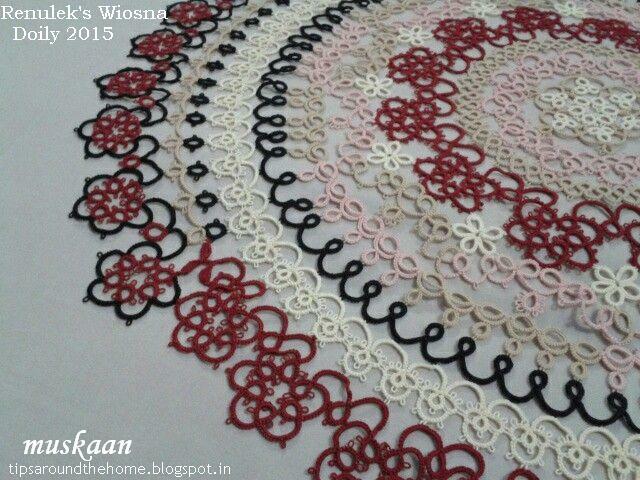 Errr, black & beige for Rnd 10 & all maroon for Rnd 11 & a Rnd 12 black chained outline …. Crrraaaaaashhhh ! Broke the rounds, now broke the globe/crystal ball ! each one has been very helpful & insightful, & it's given me a great deal of perspective ! 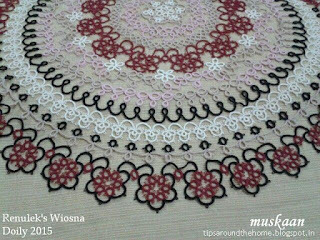 I start my 3rd round of the 25 Motif Challenge. 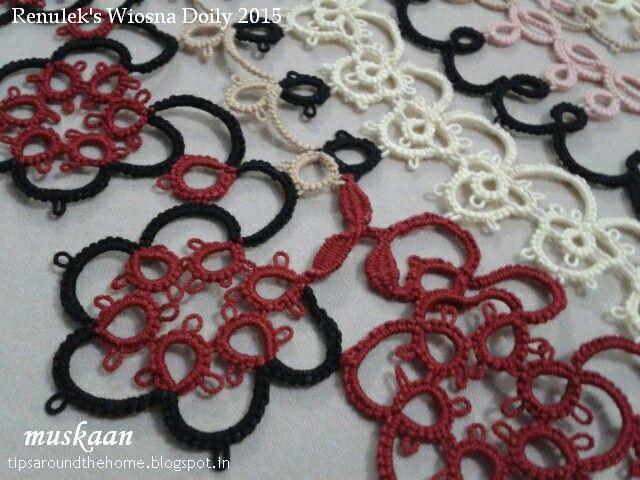 Check out this resourceful site full of wonderful tatting. 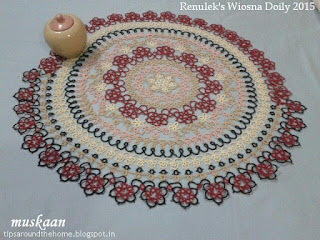 Those who have been diligently following my journey through this gorgeous pattern, are aware of how much I learned & applied tatting wisdom compiled by generations , my experiments with colours, And tatting technique options ; know the dilemmas I faced, especially the last 2 rounds. I sought advice on the decisions to take at this crossroad, & you willingly & wisely suggested 2 main paths. 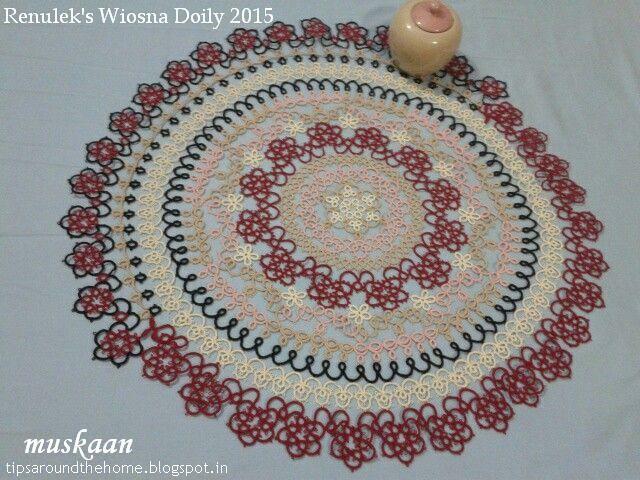 I shelved the doily for many weeks, grazing in newer tatting pastures. Since I haven’t yet shared pics after each round, on my blog, here’s each leg of the journey (with close ups of the later rounds) .... Click on any pic for larger images. Joining picots in most rounds were small as per instructions. SSSR ; anchoring vsp for petals & Rnd 4 long chains . Flower motifs of Rnd 5 were made First & joined while tatting Rnd 4. Colours switched for segments, not for elements . Elaine’s Reverse Join would’ve been ideal to switch colours between segments. anchoring vsp for long chains. 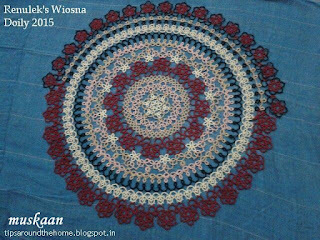 15 repeats in 2 full bobbin loads. I will continue the last leg of this journey in the next post. 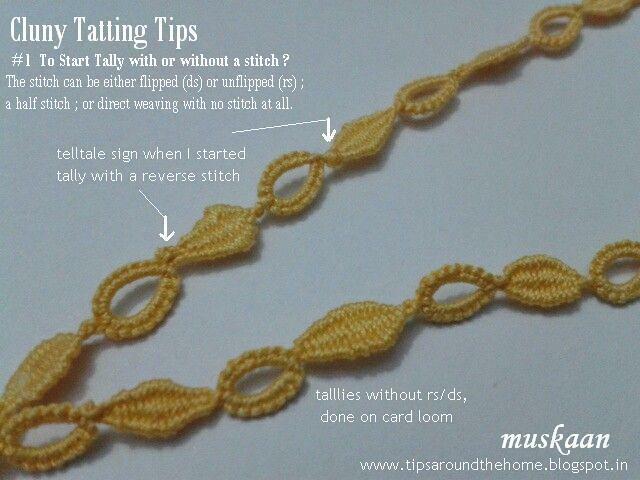 I have uploaded the pattern & diagram for the Tails & Charms used in Robin’s Frauberger Bookmark (on request by GS). 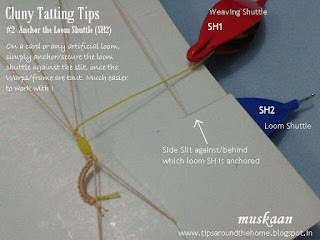 Although I have updated the post (and also added another picture showing the bookmark with a Single tail), the title here is also a direct link to the pdf.